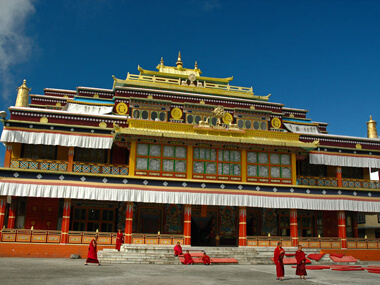 This tour packs in all the highlights Darjeeling and Sikkim the 'Queen of Hills" has to offer. After visiting the charming tea gardens and a dawn visit atop Tiger Hill we will drive through the lush Teesta valley to Gangtok the capital of Sikkim . Walk through the fascinating bazaar full of local products and produce in Gangtok. And above all visit Rumtek Monastery which is the present seat of the famous Karmapa Lama of the 'Black Hat' Kaygu sect of Tibetan Buddhism. A comprehensive tour for those looking for a short but comprehensive holiday. 01 Arrive at Bagdogra airport/ New Jalpaiguri railway station. Drive to Darjeeling . Transfer to your designated hotel. Overnight at hotel. 2100 m/105 kms/3 hrs. 02 Early morning visit to Tiger Hill for sunrise. On the way back visit Yiga Choling monastery, Batasia Loop (War Memorial). After breakfast visit the Mountaineering Institute, Zoological Garden, Tibetan Self Centre and a Tea Garden. O/N at hotel. 03 After breakfast drive to Pelling. Transfer to hotel/Resort. Later drive to Khechophalri Lake . Overnight at hotel. 2085 m/115 kms/5 hrs. 04 Drive to Gangtok, the capital of Sikkim via Ravangla. On the way visit the Pemayangtse monastery and Rabdentse Palace ruins. Transfer to hotel. O/N at hotel.1600 m/117 kms/4 hrs. 05 City tour of Gangtok which includes the famous Rumtek monastery, Institute of Tibetology , Dodrul Chorten, flower Show, Handicraft centre and Enchey monastery. 06 After breakfast full days excrusion of Tsomgo Lake near the Indo-Tibet border. Return to Gangtok. O/N at hotel. 12,400m/34 kms. 07 Afetr breakfast drive to Kalimpong. Transfer to hotel. Later visit Zangdok Phalri monastery, Tongsa monastery of Bhutanese origin built around 1692, making it the oldest monastery in the region. Also visit the Kalimpong Art and Craft centre. O/N at hotel. 08 After breakfast drive to Bagdogra/ New Jalpaiguri/Phuentsoling for onward journey.